"Opening- Member Print Exhibit at the Gallery at Grosvenor Park-OFF SITE -7 Loring Hill Ave- Salem-MA"
Our 2019 yearly member exhibit at the Gallery at Grosvenor Park in Vinnin Square on the Swampscott/Salem line will be held from March 1 until March 28 The address of the gallery is 7 Loring Hills Ave., Salem. The opening and the show are open to the public. The exhibit will be hung on March 1 and the opening will be held on Sunday, March 3, from 3:00 to 5:00 P.M. It is a lovely event with the gallery providing refreshments of wine, coffee, cheese, crackers, hot hors d’oeuvres and dessert. The show will end on March 28. 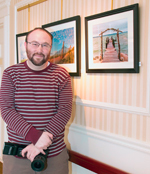 The new exhibit curator for Grosvenor Park is GLPA member C.J.Karch. Thanks to Andy Levine, Caroline Stella and Peter Miller for taking the photos. For club members-the prints will be returned to you on Monday, April 1. Another option is to bring your prints directly to Grosvenor on Friday, March 1, between 9:00 and 9:30 A.M. If you do this you must pick them up there on Thursday, March 28 at 4:00 P.M .when we are taking them down. If you plan on doing this, please let me know ahead of time. Prints will be collected on Monday, February 25, at the club. Framed prints are required, ready to hang with a wire across the back - no saw tooth hangers can be used. One or two prints may be entered with a maximum size of 18 x 24. Titles and prices should be emailed to me ahead of time. If you wish to have your prints pictured on the postcard invitation or the poster for the gallery, you must e-mail me a jpeg by January 15. We hope to hang 50 prints. This is a great opportunity to show your work and share it with your friends and the community. You never know when someone will see it and wish to purchase it. No commission is taken but we hope that you will consider making a donation to the building fund if you make a sale. Framed prints must be packed securely so they will not be damaged in transport. A case with padding or large heavy cardboard box is best. Please do not use pieces of bubble wrap taped together. Remember we must repack them for transport back so make it simple for us. Packages should be marked with your name on the outside. Also keep in mind that the gallery is in the business wing of a nursing facility where the patients constantly walk by on their way to physical therapy. Make sure your photograph is appropriate for that environment. 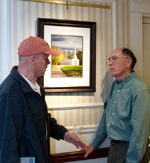 For more information about our exhibits, please see the Print Gallery Exhibits page on the website. Go to the activities page and in the left side column click Gallery Exhibits.